A chemical substance is any material with a known chemical composition. For example, water has the same properties and the same ratio of hydrogen to oxygen whether it came from a river or was made in a laboratory. Typical chemical substances found in the home include water, salt (sodium chloride) and bleach. 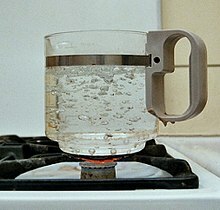 Generally, substances exist as a solid, a liquid, or a gas, and may change between these phases of matter when there are changes in temperature or pressure. This page was last changed on 28 August 2017, at 17:41.